As a furnituremaker who uses exotic and rare materials, I often find myself engaged in heated discussions about the ethics of doing so. It is lamentably true that, despite the lessons of the past, we are still abusing our natural resources, with dramatic consequences for the foreseeable future. The tropical forests are disappearing at an alarming rate and animals are being poached for their shell and ivory. The sustainability of our planet’s resources is a very relevant question for the modern maker. At Yannick Chastang, we are concerned about making the best use of our natural resources, but we are also aware that it is a complex issue. A small workshop like ours has very little power to change the world but we believe that every effort, on every scale, can make a difference. Our actual consumption of exotic timbers and precious materials is very small and there is no doubt that our usage, and that of the other many small-scale furniture makers, are not the main causes of the disappearance of the tropical forests. Compared to the demands of the food industry, the oil industry and other industries that set out to meet the desires of an over-expanding global population, the impact of furniture making on extinction of tropical tree species is actually negligible. Burning down forests is the quickest and easiest way of clearing land for new crops and many beautiful ancient trees simply go up in smoke. But this is not an excuse for us cabinetmakers to ignore our bit and Yannick Chastang takes conservation of natural habitats very seriously. Over the years, our workshop has been lucky enough to acquire old stocks of timbers and materials from workshop closures, even some purpleheart from Gallé’s own workshop in France. We also try to re-use old timbers from broken, non-reparable, pieces. It concerns us greatly that we have only a very limited stock of Madagascan ebony that we reserve for very special conservation projects. Once it is gone, there will be no more on the market and we will certainly not want to buy any new wood until the political situation in Madagascar has been resolved. The Madagascan government, and those of many other countries, need to be encouraged to take care of their forests in a responsible manner. As a cabinetmaker, I do not want to be forced to use only locally grown sustainable woods. Making furniture only in oak would pose great limitations and, to my mind, make wood boring and ultimately, redundant. I strongly feel that a furniture-maker’s “duty” is to showcase the beauty of wood thereby keeping it valued and loved. In our opinion, the most important way to respect our environment is to esteem and honour our resources. We are great believers in the making of quality and durable products that celebrate our natural heritage. We are inspired by antique furniture pieces of the past. An antique piece of furniture, made two or three hundred years ago, has been loved and cherished much longer than any of the mass produced pieces seen in today’s shops. Mass-produced furniture, even if made with wood from sustainable forests, has an enormous ecological impact. The pieces are not durable and energy is used remaking them not to mention the costs of disposal and recycling. 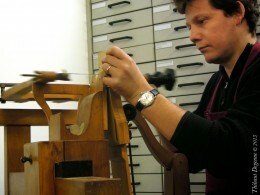 In contrast, antique furniture pieces were made by hand and are still being used today. Our aim is to make modern furniture that will become the antiques of the future. By making top quality furniture, we hope that our furniture will outlast the original owner and be used for years and, hopefully, centuries to come. In Yannick Chastang’s opinion, the best way to respect our natural resources is to celebrate their beauty and not to waste them on poorly designed or poorly made furniture.